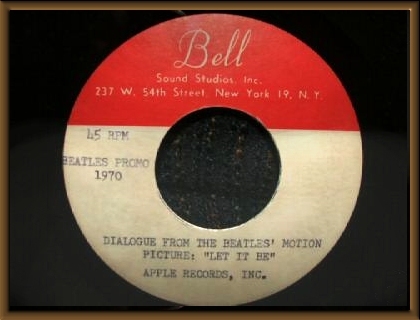 Offered here is a rare one-sided Bell Sound acetate of the Beatles Dialogue From The Let It Be Motion Picture. The 7" 45 r.p.m. disc is in Near Mint condition on the play side. The blank side rates VG+. The labels are in Excellent condition with only minor 'bleed through'. It comes in a plain white sleeve.